A disgrace to the (rather nice) jersey? Footballers are a strange breed in a strange situation. They can be lionised one minute for being good at their job and pilloried the next for doing something morally questionable which has nothing to do with their job. Take the case of Ryan Giggs for instance. A few weeks ago he was seen as "Mr Nice Guy" and the elder statesman of Manchester United's playing staff, second only in saintliness to Bobby Charlton. Now his stock has never been lower because of the sort of personal life which the public seem quick to condemn but lap up daily on Jeremy Kyle or Jerry Springer. Ryan Giggs is as good a player as he was six months ago but the sheen has come off him and he's no longer the housewife's choice he at one time was. Ironically if he were an actor or a pop star this behaviour would probably make him edgy and get him on chat shows. In sport though it means the end of sponsorship deals and undoubtedly pithy chants from opposing fans. Now here's my question, if Ryan Giggs wasn't a footballer and was let's say a lawyer or car salesman for arguments sake would anyone even care what he did in his private life? I'm not condoning his behaviour, far from it, but if the people involved want to live like that and accept the situation then that's their business and frankly I couldn't give a toss. Giggs is pilloried by the media (or given the Tiger woods treatment as it's known) for having a dubious private life. He's not the first, he wont be the last and in the great scheme of things it doesn't affect his ability to do his job. It's not like anything criminal has happened, distasteful yes but not illegal. don't feel too sorry for footballers though. If they turn out to be alcoholics or wife beaters it seems to turn them into folk heroes. The rousing ovation given by Glasgow Rangers fans after Paul Gascoigne confessed to domestic abuse or the pseudo-state funeral given to George Best by Belfast just go to show that so long as you're a footballer just about anything can be forgiven. I understand that alcoholism is an illness but people should be lauded for beating it, not living with it and letting it contribute to their downfall. 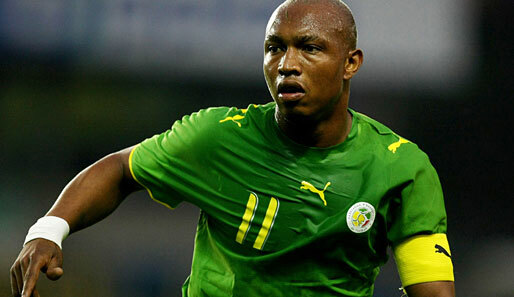 Now take the case of everyone's favourite pantomime baddie, Senegal's El Hadji Diouf. Now this guy is a peice of work. I say this with no axe to grind with any club he's played for in England but here's a guy who really does need a look at. Diouf has been at best a decent player in his time in England. His roll call of clubs show his level. Liverpool, Bolton Sunderland and Blackburn have all thought better of employing him (although Blackburn still have to find someone to take him permanently). I'm not trying to be deliberately provocative to Liverpool in that last sentence but they weren't great under Houllier and Diouf was only one of many, many bad purchases in that period. Let that be a warning to everyone not to buy a player based on tournament performance. Remember Toto Schillachi, Oleg Salenko or Milan Baros? Rubbish players bought for far too much money after three or four good games in a summer tournament. Anyway, back to my point, Diouf is a different kettle of fish to a Giggs, Rooney or John Terry. Diouf regularly disgraces himself while playing football or to be more legalistic about it, while on duty representing his employer. He's not a hard player or even a dirty player per say, every club has their hard men and they tend to be cult heroes but Diouf is a player with a history of spitting and generally instigating trouble. I've played football and am willing to forgive anyone the very occasional red mist moment but Diouf has down the years spat at two different set of opposing fans and in at least one opponents face and, with a real touch of class taunted an opponent with a leg broken in two places, all done while wearing the kit of his employers. I'm no employment lawyer but am fairly sure that if anyone reading this goes to work tomorrow and spits in someone's face it will be the last thing you do in that job. Why is this tolerated by someone who is a pretty average footballer and is on tens of thousands of pounds a week? Is it because he's a great player? Well no, not particularly. Not at all actually. If a club were to terminate his contract he could walk away and sign for someone else and probably would but so what? What does a player have to do for a club to say enough's enough, that behaviour is not befitting an employee of this club ergo you're not fit to wear the jersey? I don't know but I suspect Diouf is on a mission to find out. Blackburn did at least have the sense to get Diouf out of town last season and bump him on loan to Glasgow Rangers where I'm sure he fitted in nicely with such club ambassadors and paragons of upstanding behaviour as Kyle Lafferty but must surely want to get him off the books for next season. There's rumblings of Sam Allardyce wanting Diouf at West Ham which isn't surprising as Big Sam seems to regard Diouf as his own personal winged monkey and take him from club to club. So there's my question - why do people care what footballers do off the pitch and tolerate what they do on it? Were Diouf to sign for my team he would undoubtedly be the highest profile player at the club but I honestly wouldn’t want him wearing my team’s colours and badge. Ultimately a club’s reputation and heritage must stand for something to the fans, if not the management. Maybe I’m a bit of an old traditionalist but I’m not sure I’d want a player, however good to represent my club if he has consistently shown himself to be a reprehensible disgrace to the jersey repeatedly. What he does off the pitch so long as it’s not criminal is his business. · Don’t lionise footballer and regard them as role models because their good at football. It doesn’t stop them being philanderers, drunks or generally unpleasant in the real world. · A player, while on the pitch represents the club. If that club stands for ANYTHING then a certain levels professionalism and behaviour has to be adhered to. Failure to enforce it simply tacitly accepts and endorses the miscreant acts.